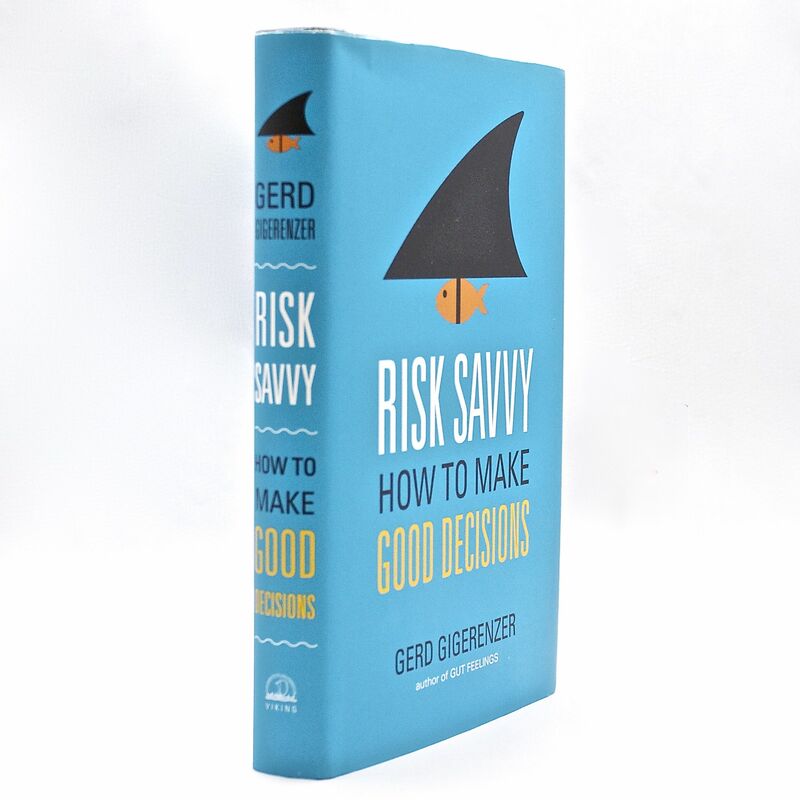 Risk Savvy: How to Make Good Decisions - IFA Vintage and Current Book Library - Index Fund Advisors, Inc.
Innumeracy is a word coined by cognitive scientist Douglas R. Hofstadter in the early 1980s to describe a lack of basic mathematical ability as it applies to everyday life. Later that decade, mathematician John Allen Paulos published a book of that title which expounded on the consequences resulting from confusion about basic concepts such as the difference between a million and a billion. Risk Savvy is certainly of the same genre, and it definitely takes a prescriptive stance toward addressing this pervasive problem. Nowhere is the problem of innumeracy more apparent than in the realm of risk assessment according to Professor Gerd Gigerenzer, the director of both the Max Planck Institute for Human Development and the Harding Center for Risk Literacy in Berlin, Germany. Gigerenzer's first message to us is that we worry too much about things that have a very low probability of harming us like a terrorist attack, a plane crash, or a shark attack, and we worry too little about consequential things like obesity, getting enough exercise, and avoidance of destructive habits like smoking. Naturally, and as we so often point out with respect to investing, we are all influenced by what the media wants us to focus on, which, of course, are those things that pique our interest and keep us coming back. One of the most common misconceptions is the difference between absolute risk and relative risk. For example, if an otherwise beneficial drug were to double your risk of getting a certain type of cancer, you might be scared away from it, but if it were presented in terms of increasing the cancer risk from one in 10,000 to two in 10,000, then it’s not so bad. As Gigerenzer points out, even the most well-educated among us have risk literacy issues. For example, physicians have a very difficult time understanding that a positive test result for a disease such as HIV does not equate to a certainty (or anywhere near certainty) that the patient actually has the disease. This uncertainty stems from the fact that many diagnostic tests will give a false positive reading on a small percentage of subjects who actually do not have the disease, and there is often a greater likelihood that someone who tests positive belongs to the non-infected group. All of this falls out of a formula known as Baye’s Theorem, and Gigerenzer presents it in a very clear and understandable way. One of Gigerenzer’s points that I definitely found surprising is the relative uselessness of many screening tests such as prostate cancer for men. While detecting a cancer at an earlier age may seem advantageous because it affords the possibility of early treatment, for this disease, it has no bearing on the ultimate mortality rate. Arguably, the men who find out they have prostate cancer later in life (when the symptoms manifest) are better off because they avoided all the treatment (i.e., chemotherapy) that would either have failed to stop its progression or would have exposed them to another disease resulting from the treatment. Gigerenzer is quick to point out that excessive use of screening tests is just one symptom of a problematic health care system where doctors have a perverse incentive to practice overly defensive medicine. Not surprisingly, my favorite chapter was the one titled, “Mind Your Money”. It demonstrated beyond a reasonable doubt the worthlessness of “expert predictions” with regard to things like future currency exchange rates and stock prices. Finance is a realm that is governed more by unquantified uncertainty than by quantified risk, and for such situations, simple rules of thumb can prove more effective than complex risk models such as the ones that failed the large banks (and the rest of us) so miserably in 2008. The science behind the success of these rules of thumb was the topic of Gigerenzer’s prior book, Gut Feelings. One problem exacerbating a troubling situation for investors is the all-to-common innumeracy of financial advisors. Gigerenzer cites an example from Austria where six out of ten advisors were unclear on the distinction between a one-time bonus of 9% and a 9% interest rate that is earned on an annual basis. For a client to trust his or her financial advisor, Gigerenzer advises that the client verify that the advisor understands and can clearly explain how different financial products work. Furthermore, the advisor should have no conflicts of interest (i.e., should be acting as a fiduciary). Unlike some other pundits who have raised concerns about innumeracy and other behavioral problems that lead us to sub-optimal decisions, Professor Gigerenzer refrains from advocating top-down approaches to “nudge” us toward good behavior. His pedagogical approach clearly falls into the “bottom up” category of encouraging ordinary people (including young children) to become more risk savvy which will lead them to make better decisions and will ultimately lead to better choices by our political and business leaders. I highly recommend this book, even for people who have studied probability and statistics and consider themselves to be adequately risk savvy already. There is always room for improvement.